George H.W. Bush on Romney: "Get behind this good man"
Mr. Bush, the 41st president, urged Republicans to coalesce behind Romney. From his office in Houston, with Romney sitting at his side, Mr. Bush said "it's time for people to all get behind this good man." "We've known Mitt for a very long time (and) he's the man to do this job and get on and win the presidency," Mr. Bush said. The endorsement comes one day after Florida Senator Marco Rubio backed the former Massachusetts governor. Former First Lady Barbara Bush offered her praise of Ann Romney, saying she will be the "greatest" first lady. 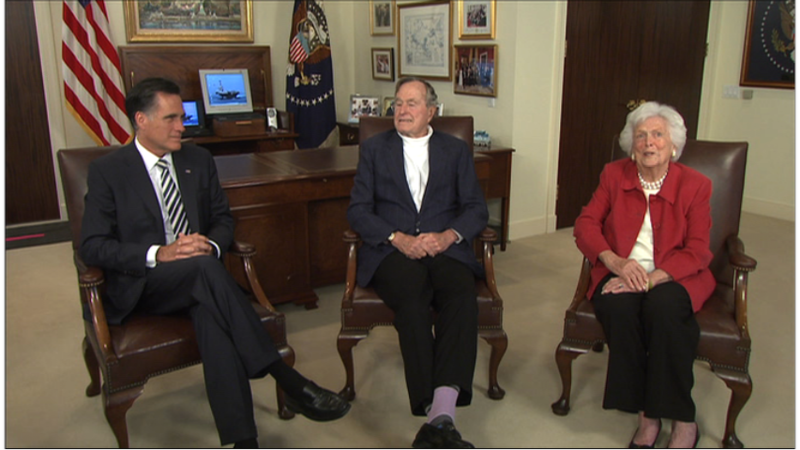 "Ann Romney is going to be the greatest," Mrs. Bush said. The former president interjected and said "next to Laura," referring to his daughter-in-law, former first lady Laura Bush. Romney said he is "honored" to receive the former president's endorsement. He also said the nomination process needs to end soon. "I think it's important for us to select a nominee and to get on with a campaign which will focus on two very different visions for America," Romney said. Chief Washington Correspondent Bob Schieffer said on CBS Evening News that the endorsement shows that "the Bushes belive Romney is going to win the nomination." In response to a question from a reporter, Romney said he has not met with George W. Bush, who has not endorsed, during his trip to Texas.